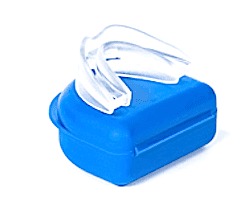 AVEOtsd probably is not quite what comes to mind when you picture an anti-snoring mouthpiece, especially if you have only been exploring mandibular advancement devices (MADs). Well, it may not be what you have in mind, but I think it may be a good option for some people, depending on your preference. More than five years of research went into creating this noninvasive device, and although not my favorite stop snoring solution, it is one I like and recommend. 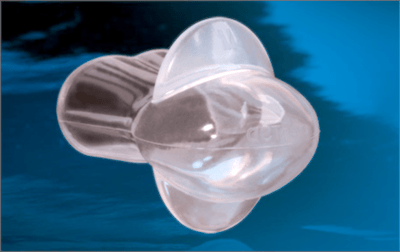 As I have found with all snoring solutions, AVEOtsd has its share of pros and cons, I had a few small complaints myself. Make sure you consider both when making your decision. This device is made from medical-grade silicone that is soft against your tongue and gums, so you don’t have to deal with any irritation. The product is doctor-designed and proven effective with clinical studies. No fitting process is needed prior to using AVEOtsd. This device is ready-to-use right out-of-the-box. Available in three sizes for the best fit possible. Approximately 90 percent of snorers use a medium size. Lifespan average is about 12 months, which is pretty long for a snoring device. Some have reported their oral appliance lasting 24 months. This TSD is backed by a 6-month warranty on manufacturing defects. 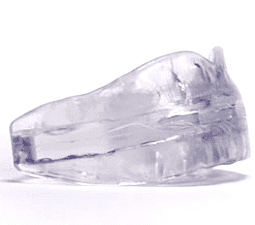 AVEOtsd can be worn by individuals with TMJ issues, dentures, missing teeth, crowns, caps, and bridgework. Since it doesn’t sit in the mouth it does not affect dental work. This device is not available without a prescription, so you have to see your doctor or dentist to get one. AVEOtsd takes a while to get used to and may cause excessive drooling when you first put it in. This oral appliance falls off, if it is too loose, but it leaves your tongue really sore, if it is too tight, so it demands a little practice to get the perfect suction. 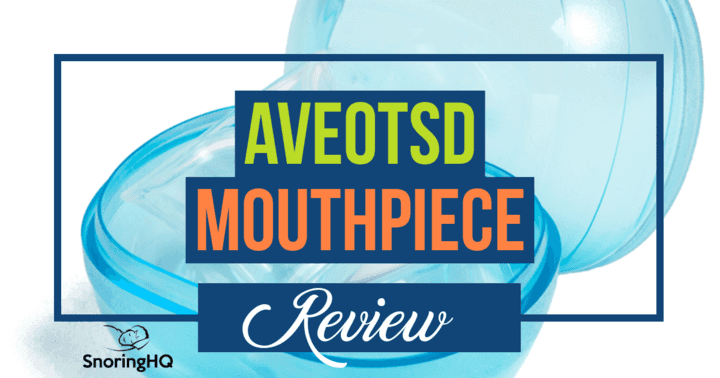 AVEOtsd is a good anti-snoring mouthpiece, with a nice design that has most of it sitting outside of your mouth. It did slip out of my mouth a few times throughout the trial, but overall very effective. I think the only real complaint compared to similar devices is that it requires a prescription, so it's a hassle to actually get your hands on one. What’s with the Weird Design? The AVEOtsd is classified as a tongue stabilizing device (TSD), so it probably looks a little odd to you. TSDs are quickly gaining popularity in the world of snoring solution products. Unlike MADs, TSDs do not actually sit inside your mouth, making them ideal for those who just can’t get used to having a traditional mouthpiece in all night. 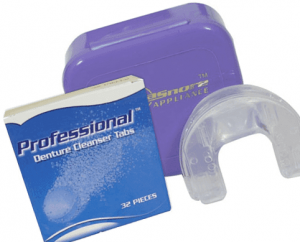 They are also suitable for individuals with dentures, missing teeth, crowns, or bridgework. Made from soft, medical-grade silicone, AVEOtsd is non-irritating and available in three sizes. The medium fits about 90 percent of snorers. There is no customization needed with this product, so you will not have to trim and file or use the boil-and-bite method prior to using it. Dr. Chris Robertson of New Zealand created AVEOtsd. He specializes in dental sleep medicine and spent several years focusing on clinical studies to develop this product. If you have read some of my other reviews then you are probably aware that traditional mouthpieces stop snoring by holding the jaw in a forward position. This stops the tongue from collapsing into the throat and causing an obstruction. Well, AVEOtsd has the same mission, but it takes a different approach. The suction end of AVEOtsd goes on the tip of your tongue. The rest of the device sits between the inner lips and outer teeth. It holds your tongue forward while you sleep, so similar to MADs, it prevents your tongue from relaxing and falling back towards other soft tissues. Prior to attaching AVEOtsd , rinse it under hot tap water. The heat softens the silicone, which will make it a little easier to get the device positioned on your tongue. Looking at the device, the V-notch should be facing the ground. Put the tip of your tongue into the bulb. To keep the bulb in place, you will need to squeeze the sides to create suction. The harder you squeeze the stronger the suction is. It should be snug, but not overly tight. Some users find it easier to make small pulsing squeezes to create a suction to guide the tongue in place, instead of positioning the tongue, and then creating the suction. You’ll probably want to experiment with both methods to see which one you are more comfortable with. The manufacturer recommends wearing your AVEOtsd around the house for several days to get used to it. If you have never worn a TSD before, and you are not used to it, you could face a few sleepless nights in the beginning. This is something you can easily do while watching television, cleaning the house, or surfing the Internet. Since AVEOtsd is only available by prescription through a dentist or physician, we had to schedule appointments to get one. We paid a little over $100 each. They average between $90 and $140 each, depending on where you get them from. I washed them both as soon as we got home, and we actually wore them right away. The site recommends wearing AVEOtsd for a week around the house to get used to it. We were pretty comfortable with the design since we had recently tried Good Morning Snore Solution (GMSS). So, we only wore it off and on until the following night before we started the trial. I will say that I think I drooled a lot more with AVEOtsd than I ever did with Good Morning Snore Solution, and it was a little harder for me to achieve the correct suction. In fact, when I woke up the first morning, I found it had fallen off at some point. My wife’s device stayed on all night. She was energized and in a great mood. I was still half asleep. I can only assume it fell off early, so I snored and slept poorly all night. The next night, I made the suction a little stronger, and I was thrilled to wake up the second morning with it still in place. My wife had gotten up in the middle of the night to get some water, and she said I wasn’t snoring at all. The third night, our senior dog woke me up to let him out for a bathroom break, and my wife was sleeping soundly. I did not hear a peep out of her. The AVEOtsd was effective at stopping our snoring for the seven-day trial. I did struggle to get the ideal suction several nights, but it only fell off the first night. Also, by the fifth morning, neither of us had a sore tongue anymore. Do to the design it can’t be worn by individuals who breathe through their mouth, so it is not suitable for those with nasal polyps, deviated septum, or sinus issues. If you have allergies, you will want to have a backup option for those nights when your nose is stuffy and you have to breathe through your mouth. Some snorers need to have a spacer added for their device to be more effective. The silicone that this device is made of will discolor if you have GERD. I found AVEOtsd to be effective, but it takes a little extra effort to get the suction strength just right. This device is made of soft silicone, so it doesn’t irritate your gums or the inside of your lips. It is easy to clean, and has a long lifespan, but the fact that you need a prescription to get one does make it a little less attractive. If you want to try a tongue stabilizing device, but you don’t want to visit your doctor or dentist, I recommend trying Good Morning Snore Solution that I mentioned earlier. It is actually my favorite snoring solution, and I found it to be a little easier to attach and get used to than AVEOtsd. Plus, the fact that you can order it online makes it a very convenient option. If you decide that you want to try a mandibular advancement device instead, I suggest either ZQuiet or Zyppah. I found both to be comfortable and effective. have you tried The Silent Treatment? Could you review that one too? I called the FDA, this device is not approved or cleared. The chemical smell is so strong after 2 weeks, it irritates and inflames the sinus all the way up. I believe it’s important to consider anything in your mouth all night and the safety of materials contacting it. Also, unfortunately if the lower jaw if shifts while sleeping on the side, will pull extra on the toungue causing additional soreness. Greatly reduced snoring.